This kid may not ever get on a roller caster again, and it’s easy to see why. 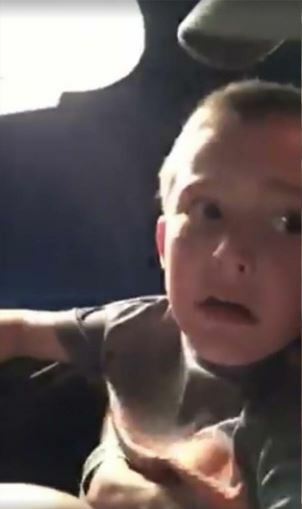 After the boy’s seatbelt malfunctioned at Wonderland Amusement Park in Texas, his quick-thinking dad was able to prevent him from slipping out of the rollar coaster – and he was able to hold onto his phone and film the whole thing. Delbert Latham and his son were riding the Mousetrap ride when the accident happened. Delbert, who shared a video of the incident to Facebook, said his son’s seatbelt came unhinged and he had to hold onto the boy for the rest of the ride to make sure he didn’t slip out. Delbert added that after he told the ride operator what happened, they continued to let people on the ride – despite being informed of the problem. The video has gained traction since being shared online, and the amusement park has since issued a statement, saying that the car containing the broken belt was removed, and the ride was fixed by Saturday. Wonderland immediately reached back out to Mr. Latham the evening it happened and promptly removed the back cart from the ride and ensured all other seatbelts were in proper working order. The Mouse Trap was back in full operation on Saturday. They also added that the ride was originally built without any belts at all, but were later added as an extra safety measure. Crazy. You would think these rides would be safer considering the recent accidents.